80 percent of the U.S. population has some form of periodontal (gum) disease. – From Centers for Disease Control and Prevention. Despite this statistic, gum and other oral diseases are 100% preventable. The secret: Practicing good, daily dental hygiene. 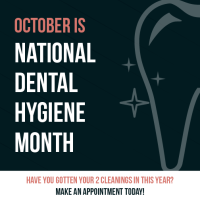 In honor of National Dental Hygiene Month, your Shoreline dentist has the top four daily dental tips you need to do to keep your smile in tip-top shape. Brush Daily – Always brush two minutes, two times a day. Floss Daily – Make it a habit. Brushing your teeth is extremely important, but it only cleans 70% of your mouth. Flossing covers the other 30% by removing plaque and food particles in between teeth. Neglecting flossing will only increase your chances of tooth decay and gum disease. Talk to our dental hygienists at Shoreline Dental to learn the proper way to floss. Swish and Rinse – Use mouthwash every day. Incorporating mouthwash into your dental hygiene routine is an important step to a healthy mouth. Be sure to choose an non-alcoholic mouthwash to avoid dry mouth and be sure to look for the ADA Seal of Approval for a supreme healthy mouth. Chew Sugar-Free Gum – Add some sweetness to your routine. Practice these four tips daily and schedule your biannual check ups with Dr. Co in Shoreline to keep your smile healthy for a lifetime!